only in theaters April 5. 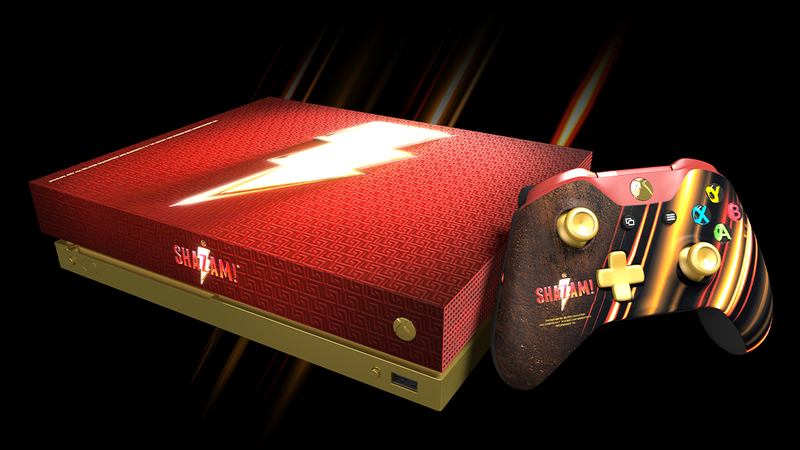 Be An Xbox Gaming Super Hero with Xbox and SHAZAM! : Twitter, Facebook and Instagram. POSTER OR ADVERTISMENT COPY (WHERE SPACE ALLOWS): USA. 16+, NO PURCHASE NECESSARY. Normal exclusions apply. Registration and then entry via Facebook [ www.facebook.com/xbox] using #SHAZAMXbox. Twitter [www.twitter.com/xbox] using #SHAZAMXbox, or Instagram [www.instagram.com/xbox] using #SHAZAMXBOX. Write in text. Max 280 characters on Twitter, 250 words on Instagram and Facebook, ‘telling us what your best friend’s super power would be and their abilities for a chance to win.’ Contest runs March 25, 2019 – April 9, 2019. Entries will be judged against criteria and winners contacted via entry method by May 26, 2019. Prizes consist of; One (1) Top prize consisting of a skinned Xbox One X console and skinned controller for the prize winner and their chosen best friend (two (2) consoles and two (2) controllers in total). Five (5) runners up will each win a SHAZAM Tote bag and a Twelve (12) month digital code for Xbox Game Pass for the runner up and their chosen best friend (two (2) tote bags and two (2) Xbox Game Pass codes per runner up). See (Terms Link) for Full T&Cs. Promoter: Microsoft Corporation. Promoter: Microsoft Corporation, One Microsoft Way, Redmond, WA 98052; no entries should be sent to this address. 1. The “Be An Xbox Gaming Super Hero Contest” (“Contest”). Contest open to legal residents of the USA who are aged sixteen (16) or older at the time of entry. Minors must have the permission of a parent or legal guardian to enter. 10. Entries without the above hashtags will not be valid. 19. The Contest opens on Monday March 28, 2019, at 00.01 and ends on Tuesday April 9, 2019, at 23.59 (The “Promotional Period”). 22. Microsoft uses the personal information provided by entrants to provide notification of important information about our products, upgrades and enhancements, and to send information about other Microsoft products and services. Microsoft will not share the information with third parties without the entrant’s permission except where necessary to complete the services or transactions requested, or as required by law. Microsoft is committed to protecting the security of entrants’ personal information and uses a variety of security technologies and procedures to help protect their personal information from unauthorized access, use, or disclosure. Entrant’s personal information is never shared outside the company without their permission, except under conditions explained above. If you believe that Microsoft has not adhered to this statement, please contact Microsoft by sending an email to privrc@microsoft.com or postal mail to Microsoft Privacy Response Center, Microsoft Corporation, One Microsoft Way, Redmond, WA 98052.